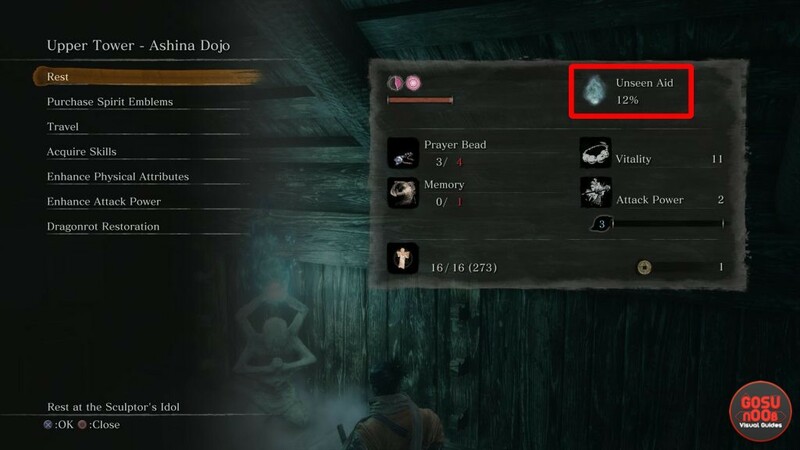 Unseen aid is a buff in Sekiro: Shadows Die Twice. There’s a chance you’ll get it every time you die, and when you do, it’ll prevent you from losing the money and experience you otherwise would. You can see the chance of getting it on the Sculptor’s Idol screen, in the upper right corner. Some players have noticed it has a tendency to go down as you progress, and have been wondering how to increase it. This guide will explain how Sekiro unseen aid works, and how to increase your chances of triggering it. Unseen aid is closely tied to dragonrot. The more characters contract it, the less chances you’ll have of receiving unseen aid. The logic behind this mechanic is that unseen aid is actually help provided by the NPCs – like the Sculptor dragging you back to the Dilapidated Temple after you’ve been mauled. If they’re ill, they can’t provide the help. This means that every time someone gets dragon rot, and you receive the Rot Essence item, the chance of getting unseen aid will decrase. Luckily, there is a way to cure dragonrot. You’ll need to talk to Emma the Physician. After diagnosing the Sculptor, she’ll instruct you to bring her a blood sample from some other NPC that has it. When you do, she’ll give you a special charm you can use along with an expensive item called Dragon’s Blood Droplet to cure everyone of dragon rot. This will restore your unseen aid chances to their base value, which is 30%. You can do this as many times as you want, provided you can get enough Dragon’s Blood Droplets. You can buy these from the Pot Noble vendor using treasure carp scales. There might be an item that increase the value above 30% later on in the game, but we haven’t managed to find anything like it so far.